Every 9-year-old has her dreams, but Alexandra Lund of Arroyo Grande is living hers. The Dellos Performing Arts Center (DPAC) company dancer earned the Overall High Scoring Junior Soloist Award at the Hollywood Vibe Dance Competition held in Santa Clara in April. Lund’s regional competition success allows her to advance to the national finals July 13 to 16 in Las Vegas, Nev. There, she will compete against other 8- and 9-year-olds for the title of national champion. “It’s so fun to watch your child find that one thing in life that they really can’t do without, and she’s been fortunate to find it,” said Alexandra’s mother, Marilyn Lund. This year’s “So You Think You Can Dance” judges included Kent Boyd, from season 7, and season 5 stars Ade Obayomi and Melissa Sandvig. Alexandra and teammate Tyler Riekki were among the five junior dancers from the Northern California region to be selected to Team Hollywood Vibe. As members of the elite company, the dancers are invited to join the Hollywood Vibe tour throughout the nation. 96 percent or higher, for her solo in competition. Earlier this year, Alexandra placed eighth overall at Hall of Fame. Her platinum score at Hollywood Connection dance competition qualified her to compete for their Icon of the Year Award and an audition with talent management agency DDO Artists Agency. “She’s just loving it,” Marilyn said. In addition, DPAC earned several awards during the weekend’s competition. One of the company’s hip-hop dances, called “Bring Back Double,” was one of four dances selected for the coveted award of Battle of the Stars competition. The placement qualifies DPAC to compete against the most highly rated dances from across the country in the hunt for the Best Dance of the Season Award. In all, the studio received seven top overall awards in the junior division, the highest number of awards provided to any studio at the competition. 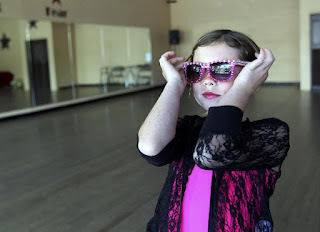 Alexandra, dubbed “Sparkles” by her teachers and peers for her positive attitude, first took dance at Academy of Dance in San Luis Obispo. She was 3 then and all about ballet and tutus. Last year, at the insistence of friend Camille Cattaneo, Alexandra attended DPAC’s summer dance camp. Shortly after, she made a permanent switch. “I really liked the school and wanted to explore the different classes and styles of dance,” Alexandra said. Since joining DPAC, Alexandra has been a company dancer under the instruction of studio owner Johnna Clark and teacher/choreographers Tahirih Ellison, Marco Cruz, and Jillian Clark. She is also an honor student at the Laureate School. Ultimately, Alexandra would like to be a professional dancer. Whether or not she attains that goal, her parents said they are happy with the lessons taught by dance. “When you understand what passion and commitment feel like, then you can transfer that to anything you want in life,” Marilyn said. Jennifer Best, a freelance writer, doesn’t think she can dance. She can be reached atjbest@bestfamilyadventures.com.